Heat oven to 425°F. Remove stems from mushrooms and carefully scrape out gills with a spoon. Place mushrooms on a baking sheet. Brush both sides of each mushroom with olive oil and sprinkle with salt and pepper. Roast mushrooms cap-side down 10 to 15 minutes until softened but still holding their shape. Let cool slightly. Meanwhile, in a medium bowl, combine ricotta cheese, Parmesan cheese, breadcrumbs, basil, garlic, egg and salt and pepper to taste. Blot away excess moisture from mushroom caps with a paper towel. Spoon 1 to 2 tablespoons marinara sauce on top of each mushroom. Top with a heaping spoonful of ricotta mixture (you might not use the whole mixture, but try to use as much as you can). Top ricotta mixture with another tablespoon of marinara sauce. Sprinkle with mozzarella cheese and a sprinkling of Parmesan cheese. Bake mushrooms another 10 minutes until ricotta mixture is set and cheese is melted and bubbly. Season to taste with more salt and pepper, if desired. Serve immediately. 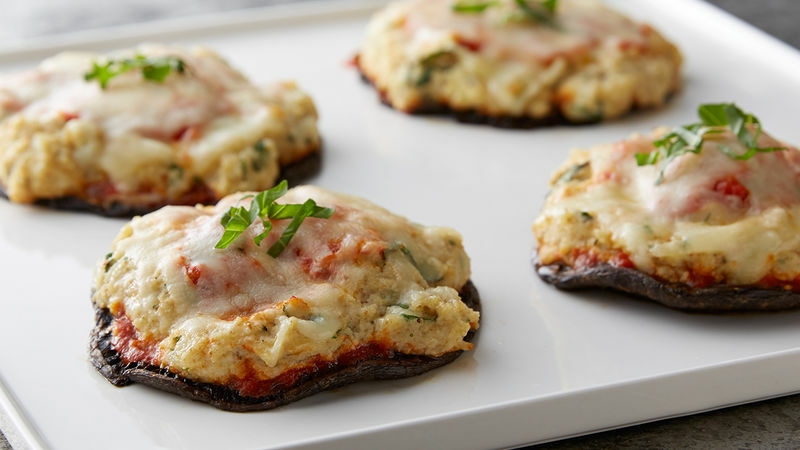 These portabella mushroom caps are stuffed with all your favorite lasagna ingredients. Fuzzy slippers. Hot tea. A good Adele ballad. There are few things I love more than lasagna for dinner, especially when that lasagna takes the form of Lasagna-Stuffed Portobello Mushrooms. Aww yeah. I know what you’re thinking – this is preposterous! How can lasagna be good without the noodles?! And a hot second ago, I would’ve been right there with you. But fast-forward a hot second later to when these easy-peasy stuffed ‘shroomies were done and let’s just put it this way – I barely had time to photograph these puppies before they were devoured. SO GOOD. Alright! Enough yakking. Time to show you how it’s done. First, clean off a few portabello mushroom caps by removing the stems and then using a spoon to carefully scoop out the gills (ewww… but do it). Place the mushrooms on a baking sheet, brush generously with olive and oil, sprinkle with some S&P and roast, cap-side down, on the baking sheet for about 10 minutes. Meanwhile, mix together the Holy Mixture of Cheesy Goodness that includes ricotta, Parmesan, Progresso Italian Style breadcrumbs, chopped fresh basil, minced garlic, an egg and some more S&P. When the mushrooms are done, flip them over and top them with a couple tablespoons of marinara sauce. Top with a heapin’ helpin’ of the ricotta mixture, then top that with another tablespoon of marinara sauce, some shredded mozzarella cheese and a sprinkle of Parmesan cheese. Let that all bake for another 10 minutes or so until the ricotta mixture is set and the cheese is melty and bubbly and seriously, I think my face just fell off from all this deliciousness. Sprinkle the mushrooms with a little more S&P to taste, maybe a pretty lil’ basil sprig, and then BY ALL MEANS, dig in already. OK, you can stare at its beauty for one more second but then FOR REAL, dig in.